I am excited to be joining the Ugly Ducking Pattern Challenge today. This is a fun challenge set by Liz and Elizabeth from Simple Simon and Company where you take an ugly vintage pattern and try to give it some new life. The ladies were generous enough to send me a pattern from their stash. I waited with great anticipation and nervously opened the package, wondering how bad the pattern could be. You might be surprised to hear that I was thrilled with what they sent. This is what I found. 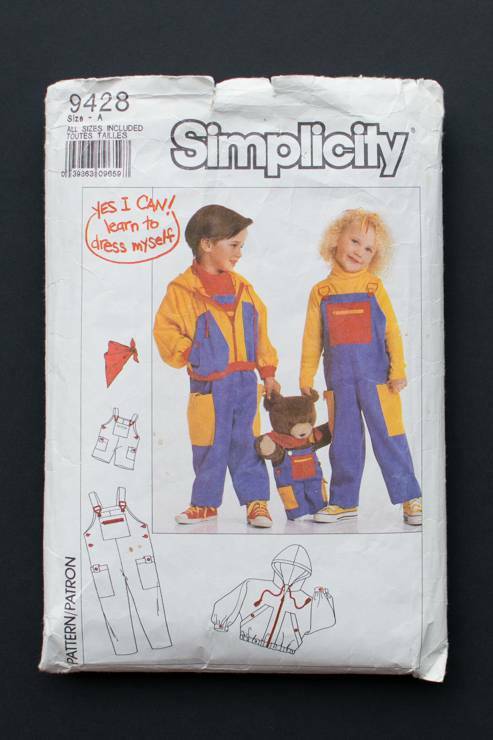 The envelope included patterns for dungarees (overalls) for children and matching ones for a teddy, plus a hoodie. I love how it says “Yes I can! 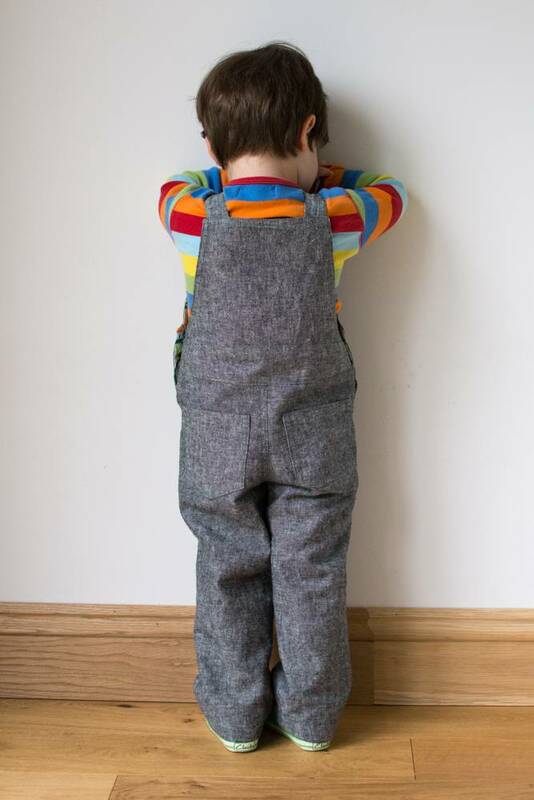 Learn to dress myself.” If I was going to choose an outfit for my children to dress themselves it would not include dungarees, which can be very fiddly to get on! As you can see, the styling is pretty bad but it definitely had potential. 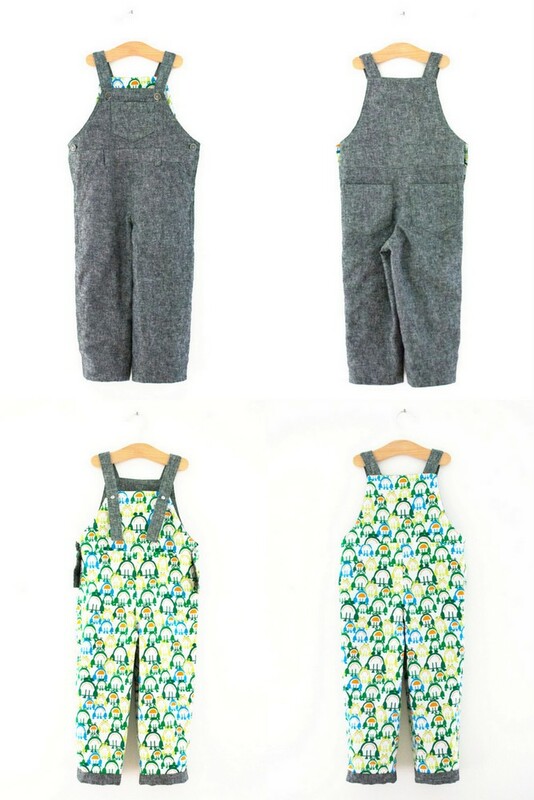 I have wanted to make dungarees for a long time so there was no question which pattern I’d pick. The first thing I did was consider what fabric to use. To protest against all the bright colours on the cover I decided on grey and settled on some yarn dyed linen in black to add some texture. I let Rowan choose the lining in the hope that he will be happier to wear them. He opted for the frogs from the Ed Emberley Happy Drawing collection. I had a Sailboat Top in mind for this fabric but with a bit of careful cutting I think I’ve managed to save enough to make one of those as well. While I was sewing I added rows of green topstitching on almost all the seams but chose to use regular thread instead of topstitching thread, so it would be more of a subtle detail. The next thing I did was work out how I wanted to alter the pattern. Those enormous leg pockets had to go and I wanted to add some other details. The pattern includes facings but I chose to fully lined these as I prefer the finish. I took the front and back pieces and separated each into three pieces for the main fabric and two for the lining. I also added inset side pockets and belt loops to the front, altered the patch pocket on the front bib and added patch pockets to the back legs. 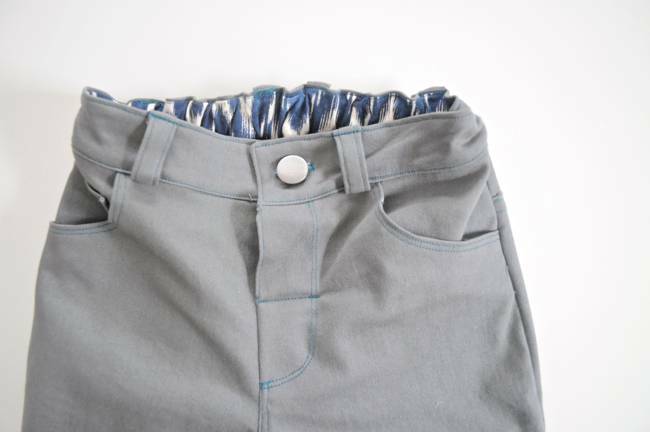 I had a lot of trouble finding adjustable dungaree clips that I liked so I went for buttons. I made the size three and I’d say the sizing is pretty good. The pieces worried me as they looked massive but I think that was due to the 5/8″ seams, which I’m not used to. They’re quite long in the leg on Rowan but he’s a bit short for his age. I did a wide double hem so I can take them down as he grows. The buttons are also quite high up the straps so I can add more once he’s taller. It’s just possible that these might last him until he’s 5. I didn’t manage to post about Fashion Revolution yesterday but this is campaign that raises some very important issues. Visit the site for more information and to find out what you can do. To make up for missing it I have some photos of the insides of the dungarees today. I am so happy with how these turned out and definitely plan to make more in the future. 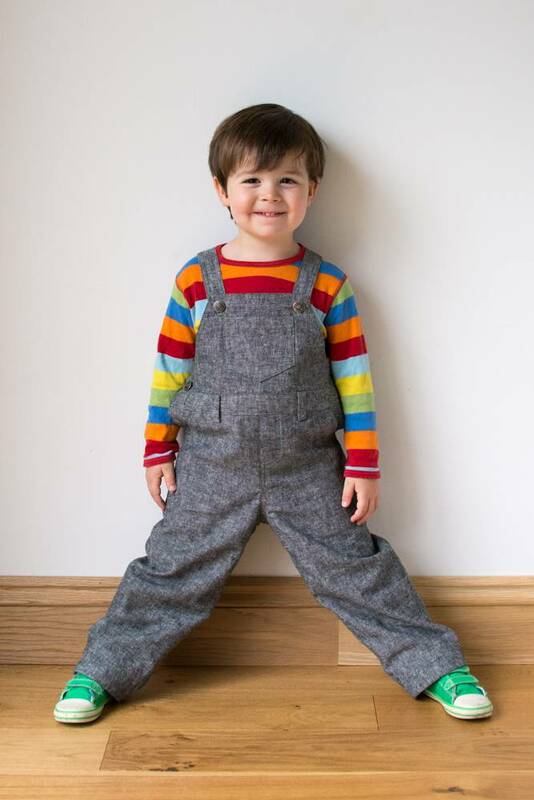 I love dungarees on little ones, they’re just so cute. 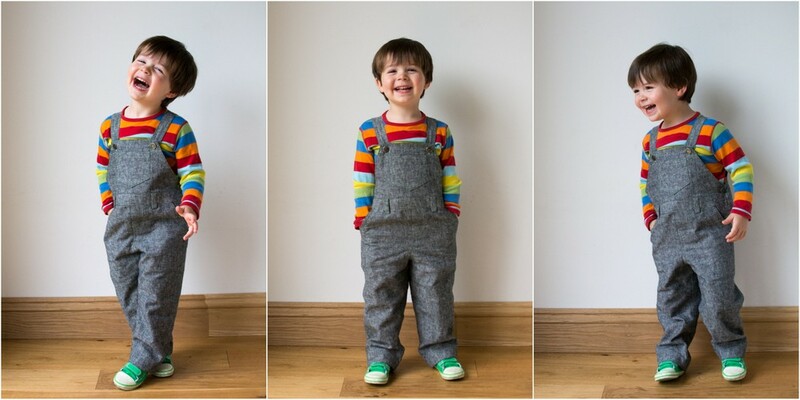 Dungarees are the ultimate perfect pattern for kids! Love your version – quite an improvement from the original pattern (which btw I didn’t find as ugly – just in need of some “professional make-over”, lol). He looks dapper! I love the idea of this challenge and your modern take looks great! Love the pocket changes you made and the black linen! Omigosh, these are CUTE! I was blinded by the pattern cover on that pattern (so. many. colors!) but you have pulled the classic essence out of the garish datedness, and made an excellent pair of overalls (that’s what we call those here in the states). And I love the lining! Good choice Rowan. He could not be cuter. These are beautiful! So fresh and modern and nothing at all like the envelope, but obviously you can see where they come from. I hate 5/8″ seams too. I usually trim them down to 3/8″ so that I can deal with them. you really worked some seriously magic, those are positively adorable! also, rowan is also positively adorable! These are adorable!! You did such a great job with them. Awww look how cute he is! 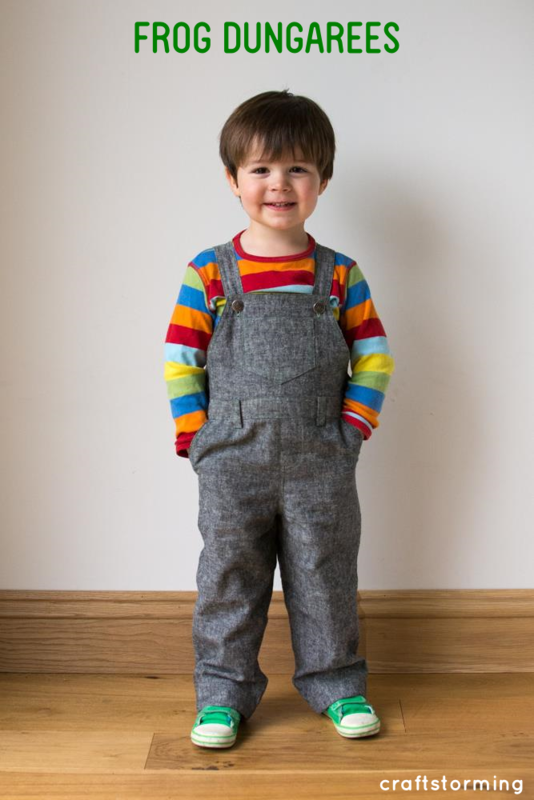 I love dungarees/overalls on a little guy. They look fantastic, nice work! Oh my goodness, those are cute! My daughter saw this post and told me I had to make a pair just like this for her little brother. I should search around for a good overalls pattern. I love them! The fabric pairing makes me happy. 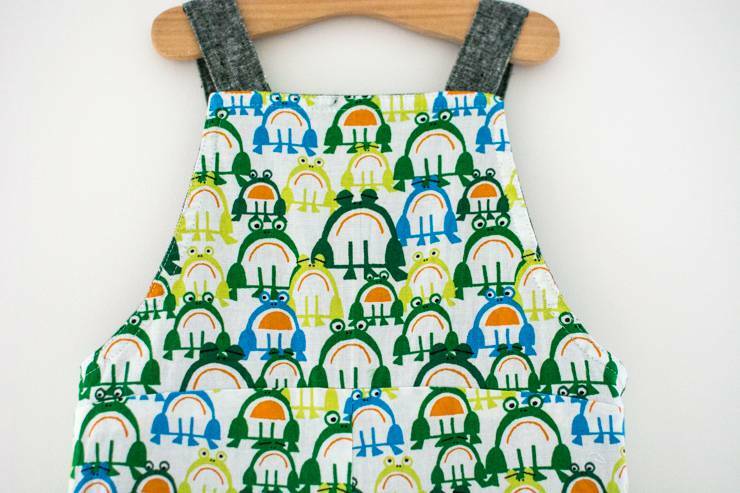 Kid friendly without being like the original pattern styling. yeesh! The jacket might actually be pretty cute too! I agree overalls (as we call them) are so sweet on little children. I have never made a pair. 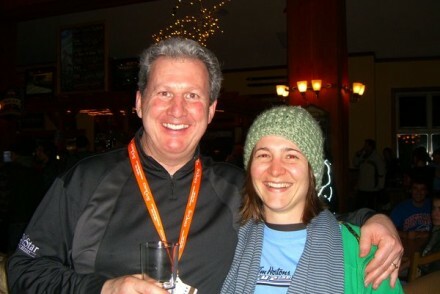 Yours look great!